Western blot analysis of extracts from MCF7 cells untreated (-) or treated with hIGF-I #8917 (+) using Phospho-IGF-I Receptor β (Tyr1135/1136)/Insulin Receptor β (Tyr1150/1151) (19H7) Rabbit mAb (Biotinylated). Phospho-IGF-I Receptor β (Tyr1135/1136)/Insulin Receptor β (Tyr1150/1151) (19H7) Rabbit mAb (Biotinylated) recognizes endogenous levels of IGF-I receptor and insulin receptor only when phosphorylated at Tyr1135/1136 or Tyr1150/1151, respectively. It does not cross-react with other related tyrosine-phosphorylated tyrosine kinases. Monoclonal antibody is produced by immunizing animals with a synthetic phosphopeptide corresponding to residues surrounding Tyr1135/1136 of human IGF-I receptor β protein. This Cell Signaling Technology antibody is conjugated to biotin under optimal conditions. The biotinylated antibody is expected to exhibit the same species cross-reactivity as the unconjugated Phospho-IGF-I Receptor β (Tyr1135/1136)/Insulin Receptor β (Tyr1150/1151) (19H7) Rabbit mAb #3024. Type I insulin-like growth factor receptor (IGF-IR) is a transmembrane receptor tyrosine kinase that is widely expressed in many cell lines and cell types within fetal and postnatal tissues (1-3). 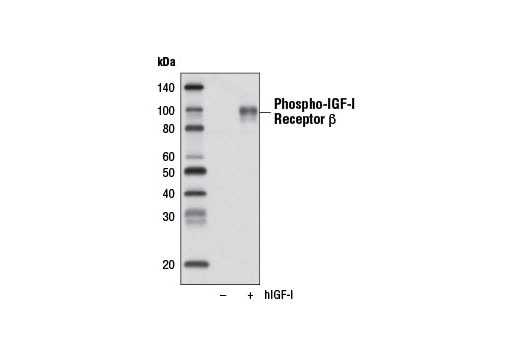 Receptor autophosphorylation follows binding of the IGF-I and IGF-II ligands. Three tyrosine residues within the kinase domain (Tyr1131, Tyr1135, and Tyr1136) are the earliest major autophosphorylation sites (4). Phosphorylation of these three tyrosine residues is necessary for kinase activation (5,6). Insulin receptors (IRs) share significant structural and functional similarity with IGF-I receptors, including the presence of an equivalent tyrosine cluster (Tyr1146/1150/1151) within the kinase domain activation loop. Tyrosine autophosphorylation of IRs is one of the earliest cellular responses to insulin stimulation (7). Autophosphorylation begins with phosphorylation at Tyr1146 and either Tyr1150 or Tyr1151, while full kinase activation requires triple tyrosine phosphorylation (8).